Virtueinfo has been one of the pioneers in the industry when it comes to Symfony framework development. Experience of more than a decade working on Symfony has cemented our reputation as a highly trusted web development agency. Symfony is an open source PHP web development framework mostly recommended by web developers as it uses set of reusable components which reduces the development time to a great extent. Furthermore Symfony is faster than other PHP frameworks and hence it is also popular among clients that insist on having a website with faster loading speed. Symfony also occupies less memory and that allows web developers to develop applications at a very rapid pace. Virtueinfo is one of the fewer companies in the world who is providing Symfony web development services since 2006. Needless to say that working all these years, our Symfony web developers are the most experienced in developing custom made Symfony based applications. We have worked with small as well as large enterprises and all of our clients are so pleased with our Symfony web development services that they have recommended Virtueinfo to all their contacts who were looking for a quality web development services provider. Virtueinfo has worked with all the versions of Symfony starting from 1.x right to the latest 4.x version. We are proficient in using all types of plugins, bundles and also ORM like doctrine, propel, mongoDB and many more. We are also comfortable with all types of development tools and project management systems. One of the main benefits of working with Virtueinfo is our 24x7 support to our clients and we immediately address their queries regarding the development process. Virtueinfo develops custom made Symfony business applications according to client's requirement. Our Symfony developers guarantees quality output and timely delivery of the project. Virtueinfo designs eye catchy Symfony themes and templates which are 100 percent compatible with your Symfony based web applications or website. We provide Symfony Template design, Template development and Template Integration. 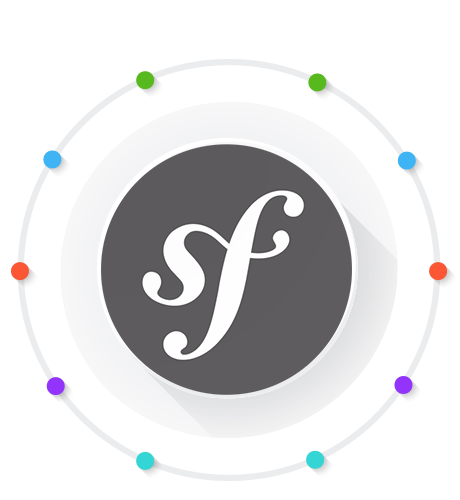 Our Symfony developers are expert in developing custom made plugins that will enhance the current functionalities of the website. We provide custom plugin development, plugin integration and plugin maintenance. Virtueinfo provides high quality Social Networking Development services using Symfony Framework. Our developers will provide round the clock support and all your queries will be addressed on the same day itself. We develop custom made ecommerce website using Symfony framework that includes design, development, store security and maintenance. Our features are integration of shopping cart and setting up payment gateway system. Our 3rd party API integration services will help you to add many latest features into your website. We provide API design, development and REST API Integration.